Floods! Explosions! Fires! When disaster strikes, the Evacupod is capable of safely transporting patients from hospitals, nursing homes, as well as serve a variety of other entities. 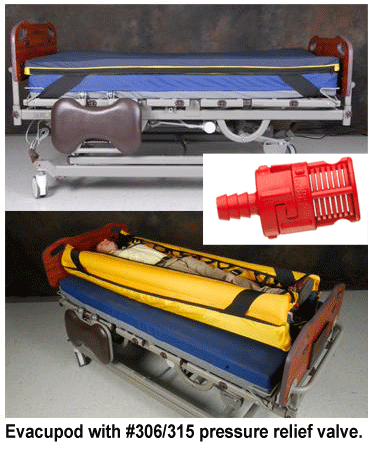 New to market, The Evacupod is designed to lay over an existing support surface, which allows caregivers the ability to activate the device and quickly evacuate a patient. See how it works by clicking here. Developed by clinicians and bio-med engineers, Evacupod uses one of Smart Products' Series 300 Modular Check Valves. This series allows customers to mix and match any two end pieces, and Evacupod used this design solution to pair a #306 Barbed inlet with a #315 Foot Valve outlet. Together, the #306/315 valve serves as a pressure relief valve to control flow and ensure the device does not over-fill with air. "Before developing the Evacupod, I worked as a mattress distributor for long-term acute care facilities and was familiar with Smart Products' valves. When we began to develop Evacupod a few years ago, I called them, and we were able to sample and quickly determine the right valve for our product," says Evacupod Owner/Partner Paul Kimbel. "We just celebrated our first sale to the Department of Veterans Affairs, VA Medical Center, and we are looking forward to serving other industries in the future." By working closely with Evacupod, Smart Products was able to create a custom valve to meet the application's specific needs, which included pressure relief, flow requirements, and the ability to work in a variety of climates. The Evacupod can be used now or in the event of an emergency and is available in three different models to comply with required policies and procedures of hospitals and other facilities. For more information about Evacupod, visit http://evacupod.com/.